The short-lived Fraternity of Man is undoubtedly best known for the pro-pot anthem "Don't Bogart Me," which showed up during an unforgettable scene in the genre-defining biker film Easy Rider (1969). The original quintet included an overhaul of the Lowell George-led Factory, featuring Martin Kibbee (bass), Warren Klein (guitar/sitar/tamboura) and Ritchie Heyward (drums/vocals). George split and became a very temporary Mothers of Invention member, while the other three joined up with Freak Out (1966) era Mother Elliot Ingber (guitar). 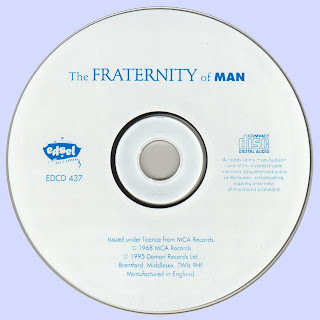 The personnel was completed with the addition of Lawrence "Stash" Wagner (vocals/guitar) and the band recorded its 1968 self-titled release Fraternity of Man. Another Frank Zappa connection could be found in the guise of Tom Wilson, who produced the Mother's earliest studio efforts. As one might anticipate, there are several prominent musical dynamics carried over into the Fraternity of Man from its former incarnation. The stoner wake-n-bake anthem "In the Morning," as well as "Blue Guitar" and "Plastic Rat" retain the psychedelic garage rock that pervaded much of the Factory's sound. The band's variation of Zappa's "Oh No" -- titled "Oh No I Don't Believe It" -- is a gassed-up rocker replete with Ingber's nimble lead fuzz fret work. Those decidedly more belligerent outings are contrasted by the intricate and Baroque qualities of "Wispy Paisley Skies" and the aforementioned steel guitar-driven "Don't Bogart Me." However, the comfortable misfit rockers "Candy Striped Lion's Tail," "Field Day," or the slightly perverse R'n'B-flavored "Bikini Baby" are among the best sides on the album.The latter was revived on the utterly dismissible dash for cash EP titled X (1995). 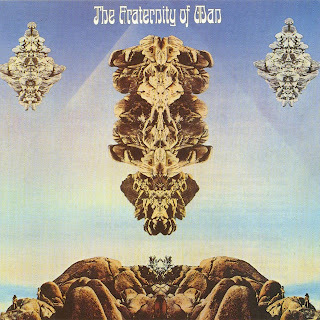 1969 The Fraternity of Man - Get It On! Although recorded in a downhill of the psychedelic era, this supercool debut of The Fraternity Of Man holds firmly onto its status as one of the greatest guitar albums of the late 60's. Crossing over wild, acid freakout to mellow country rock – undoubtedly an influence of The Byrds' Sweetheart of the Rodeo – it gives a good impression of rapdily shifting tastes in American music at the time. A record, which bends to the nearest future, when Laurel Canyon artists were to take it back to the roots with simple arrangements, vocal harmonies and personal lyrics pondering the end of countercultural revolution. A history of The Fraternity Of Man goes back to The Factory, a garage band assembled in the late 1965 by Lowell George and Richie Hayward (who were later to join Little Feat) including Warren Klein (a guitarist of The Stooges in 1973) and bass player Martin Kibbee. They never made it bigtime though and as they welcomed 1968 George decided to split and the band changed their name to The Fraternity Of Man with two new musicians hopping in: Elliott Ingber (a guitarist of The Mothers Of Invention) and vocalist/guitarist Lawrence "Stash" Wagner. Their debut LP was produced by the same Tom Wilson, who engineered first kicks of The Mothers Of Invention, finished production of Bob Dylan's The Freewheelin' in 1963 (being also a key personality to his acoustic-electric transition). And least but not least, as A&R manager he signed The Velvet Underground to Verve starting band's successful career. However, guys would have probably never stomped the scene if not their pothead classic Don't Bogart Me, which swept through the airwaves due to compiling it by Dennis Hopper as part of Easy Rider soundtrack and paved the way to other stoner ballads like One Toke Over The Line (Brewer & Shipley) or I Got Stoned and I Missed It (Dr. Hook), so popular in the early 70's. Album has been eventually released by ABC Records and included a whole pile of killing tracks, most notably another country rock goofball – Last Call For Alcohol, which has never shared the affinity of its smoking counterpart though. But the LP largely follows this line with more humorous story songs such as Bikini Baby or Just Doin' My Job. But what gives it a real bite are two ultrapsychedelic monsters: In the Morning – a great piece about smoking weed from morning to the evening with fuzzy, tonal guitar – and Candy Striped Lion's Tails, one of these deeply acid soaked late 60's creations with obligatory, minor scale, beautiful tabla lines, gutsy, storming guitar solo a la The Byrds or The Electric Prunes and great lyrics about opening the door of your mind with big dose of LSD. Almost all compositions featured on the record have been coined by the band except ironic Oh No I Don't Believe It, written by Frank Zappa and credited to Third Story Music. A must-have or must-listen for 60's psych collectors and freaks. You simply cannot go wrong with it! Thanks Marios, this is one of my favourite albums, "Plastic Rat", "Wispy Paisley Skies", "Candy Striped Lion's Tails" and the variation of Zappa's "I Don't Believe It" are mindblowing. I really want to hear their version of "Oh No ..." which is a great Zappa song. Thank you Marios and OldRockerBR, it's good to see you back!